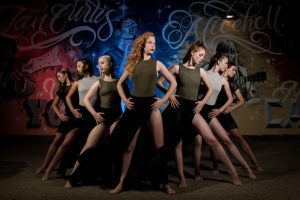 Meet the Dance Company that choreographed their performance last summer utilizing the 2015 Art Alley Mural located in downtown Red Deer, Alberta. 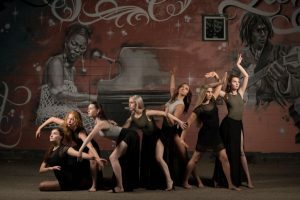 It was a contemporary dance performance called “Death before Decaf” and held at the Scott Block Theatre. The event theme addressed the fact that we are all dependent on certain things in order to continue functioning in our ordinary, everyday lives. With these common, popular and typical dependencies, how are our minds and bodies impacted? The dancers embodied and explored these everyday addictions in compelling and interesting ways. This performance speaks to the power of Arts for Social Change and how we can all create innovative ways of addressing various challenges that we face. The mural itself demonstrates the effectiveness of Placemaking in our public spaces and the impact it can often have for many years. It’s places such as this that people are drawn to repetitively and can enjoy in many different ways. Through ongoing collaboration in our communities we are able to facilitate powerful changes that bring about wellness, more understanding and the potential to transform our cities.